This award acknowledges a historic resource that has been properly restored to a specific time period. Projects must fully demonstrate adherence to the Secretary of the Interior’s Standards for Restoration. A special emphasis is placed on completed projects where owners, architects and contractors practice exceptional care in respecting the original fabric and setting of a historic structure. Early on the afternoon of January 10, 2010 a tanker truck with spray apparatus was heading north on Treviño St. in San Ygnacio, Texas. Treviño and an adjacent block were all that remained to be paved in a county-wide project. In the tank were about 750 gallons of an asphaltic road base primer, heated to just below boiling point. The primer, a “cut-back” asphalt known as MC-30, was formulated for maximum adhesion to crushed stone road base. On the driver’s right was the Jesus Treviño-Blas Maria Uribe Rancho National Historic Landmark, a fortified complex of masonry structures almost unaltered since the mid-nineteenth century. 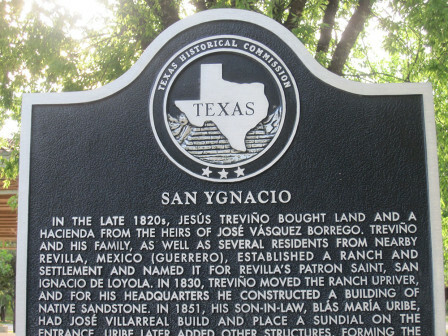 It includes the oldest surviving building in San Ygnacio, a primitive one-room stone ranch headquarters built in 1830 known as the Cuarto Viejo. Like most pre-railroad structures of this border area, the complex is built of locally-quarried, ochre-green sandstone set in earth mortar. Only a relatively fragile historic lime-based plaster protects this mortar, and helps distinguish five major building campaigns at the fort between the 1830s and 1870s. How it happened is still not clear, but by the time the truck reached the next intersection, 90% of the honorific façade of the Treviño-Uribe NHL had been coated with hot asphaltic primer. In response to the incident, the owner of the complex — River Pierce Foundation — organized a meeting of its board of directors, county officials, Texas Historical Commission, the paving contractor, and consultants. The applicant, FRANK BRISCOE/Architectural Conservation, was asked to collaborate with this group in the development of a remediation strategy, and eventually was awarded the contract for this work. Remediation of the asphalt began with careful documentation, along with observations and analysis of the damage. A series of trials was conducted away from the building, including spot tests on affected material (such as loose stones). A representative test panel was constructed with materials similar to the façade. Early in these tests, the biodegradable citrus distillate d-limonene showed greatest efficacy. Work commenced on the façade itself in February of 2012, and was completed in early June of that year. The fragility of the plaster, and the significance of the information that it held, dictated that nothing more abrasive than a soft-bristled toothbrush could be used. A method of applying the d-limonene in conjunction with a poultice of cellulose insulation proved effective, although the primer was stubbornly attached in some areas. Further investigation into applications of MC-30 revealed that used motor oil and melted tires are often constituents. Using d-limonene and very light abrasion with soft toothbrushes and china bristle brushes, the façade was gradually returned to its earlier appearance. Waste solution containing the asphalt-laden d-limonene was caught in the poultice, preventing re-adherence on the wall surface. While the contract called for a minimum of 50% remediation, approximately 90-95% was achieved.